People are the heart of the real economy. People work to produce the goods and services, innovate, save and invest. And it is for people that the economy should work to provide our needs. It should enable us to create better lives in terms of our welfare and happiness as individuals, community and wider society. But the New Zealand economy has failed to do this in crucial ways. Workers are not receiving the benefits of economic growth in their wages. Poverty is blighting a society that produces enough for everyone but fails to share it fairly. The economy is failing to thrive and is badly unbalanced. The ever more visible limits to the Earth’s resources and the misuse of our natural resources highlighted by global climate change are unsustainable. And the economy fails to make best use of the skills and experience of its workforce by excluding most of them from meaningful participation in the decisions that shape their work, industry and economy. Capitalism has never been fair nor cared for the environment. But under the neoliberal policies followed in New Zealand for the last quarter of a century not only have these conditions got worse but the policies have failed in their own terms. Those policies are rooted in the idea that less government is better government and that “the market” if left to itself will lead to faster economic growth and better outcomes for society. New Zealand has had slower growth rates and has failed to keep up with the rest of the world. The policies have enriched a small number of people, and have accelerated the migration of New Zealanders overseas. The economy has growing imbalances of household and international debt, of investment based on speculation rather than production, and of interest and exchange rates at levels that worsen rather than resolve these problems. New Zealand is unfortunately not unique. Neoliberalism has failed internationally. The Global Financial Crisis which has damaged the lives of hundreds of millions of blameless workers, farmers, beneficiaries, and retired people around the world is but the latest example of the instability, recklessness, waste and enormous imbalances of power and wealth neoliberalism has cultivated. Economic growth rates have been lower in the neoliberal decades internationally. Many countries that have ignored neoliberal advice have prospered and those that adopted it enthusiastically have been the worst hit. New Zealand escaped the worst of the crisis more by good luck than good management. Such crisis have hurt New Zealand before and will do so again, and meanwhile the inequities and failure of the policies continue to hold back New Zealand’s economic and social development day by day. The background paper created in the development of this Alternative Economic Strategy documents these trends. It is appended to this document. We do not believe these unsustainable and unconscionable trends are necessary, nor do they reflect what is good in New Zealand. New Zealanders believe deeply in the “fair go”, and in recent years have shown our increasing willingness to acknowledge Māori history, culture, and rights and address their grievances. We care about our environment, and have a growing sense of national identity and independence. We have had among the highest participation rates of voters in elections. We pride ourselves on being innovators both technically and socially. We were the first to give women the right to vote and early adopters of an effective welfare state. Economic growth, growth in real wages, unemployment and distribution of the benefits of the economy’s production have all been markedly better in the past, particularly between the end of the Second World War and the 1970s. For many years, New Zealand was one of the highest income countries in the world, and one of the most attractive countries to live in. We look back not to glorify those years. They were far from perfect with social intolerance, suppressed Māori grievances, and inequality for women. But they do show that New Zealand can do much better economically. Indeed, the world economy did much better during those years, with international financial crises relatively rare and faster economic growth. International agreements to regulate capital movements and peg exchange rates, and which allowed a variety of strategies for economic development were effective in supporting development which focused on production rather than financial manipulation. It was the growth of a finance sector far beyond the needs of the real economy that encouraged and inspired neoliberal ideology, along with the powerful economic forces of corporate globalisation which demanded the increasing deregulation and undermining of the social functions of government which have been so damaging. They said “leave us alone and the world will be a better place”. In fact the financial sector enriched itself at the expense of the rest of the economy, taking absurd risks, too often behaving unethically and even criminally, harming hundreds of millions of hard working people and causing huge damage to the real economy which blameless workers will be left to pay for in lost income and taxes. In addition, deregulated corporate globalisation has replaced well paid secure jobs with vulnerable low paid jobs. • entered international trade and investment agreements which removed much of our ability to manage our international economic relationships and made many of these actions difficult or impossible to reverse. Despite the propaganda, New Zealand’s economic growth and international competitiveness have stagnated. This Strategy is a response to these failed policies. We need to measure our own policies and those of others against principles that can stand the test of time. Fairness includes reducing the high and damaging levels of inequality that neoliberalism has encouraged; working to ensure women, Māori and Pacific peoples are no longer disadvantaged in New Zealand; and valuing a diversity of cultures, ethnicity, and sexual orientation, which add a richness of viewpoints and experience to society. 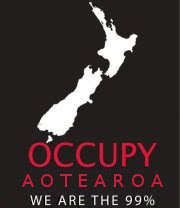 Participation includes an active voice in our workplaces and industries, ensuring workers’ knowledge and skills help develop productive and dignified work; an active voice in our society beyond one vote every three years; and active recognition of the partnership between Māori and the Crown founded in Te Tiriti o Waitangi. Society can and should shield individuals from the worst of booms and slumps, and assist them through difficult times in their lives. A spirit of collectivism and solidarity is important for a stable society. The State plays an irreplaceable role in setting policies, stabilising the economy in times of crisis, providing security of income to individuals, and providing universal services. Security includes security of employment and full employment; security of income when we suffer misfortune, and when we have children or retire; and the role of unions in maintaining incomes, protecting jobs and advocating for better social conditions. Improving living standards is about incomes, but it is also about reducing inequality, ensuring no-one has to live in poverty, and the many non-wage aspects of living which are essential to our quality of life. These include the social wage – the services, benefits and assurances provide by the state; leisure; and the quality of our environment. Sustainability is meeting the needs of the present without compromising the ability of future generations to meet their needs. It includes the environment – avoiding and reversing pollution, long term damage such as climate change, and over-consumption of finite resources; the economy – reversing high international liabilities, raising sufficient revenue in the medium term to pay for quality government services, sufficient investment for the economy to replace itself and develop, and incomes high enough to avoid skills and population loss; and society and culture – valuing our own history, media, languages, music, drama, literature and sports which make people feel they belong here. These principles apply not only for our own country, but also in how we work internationally. Inter-governmental organisations and legal structures are too often designed to suit the commercial interests of international corporations. Greater economic, social and cultural interaction between peoples is to be welcomed. But it needs to be fair, recognising that people come first, that many international interests require cooperation rather than competition, and that individual nations and peoples need to maintain the power (sovereignty) to determine the rules and priorities required for their welfare and development. We seek a coherent alternative to current policy principles and institutional structures which will improve the position of working people and New Zealand. As we described elsewhere in this document, current economic policies and principles have demonstrably failed. A new approach is needed which learns the harsh lessons of not just the financial and economic crisis, but the trend of economic events that led to that calamity. We also need to learn from New Zealand’s recent history and the unsustainable degradation of the environment. We want policies which work together to strengthen each other and are sustainable, not only from the point of view of government finances, but also because they create and nourish a healthy economy, a healthy society and a healthy environment. Below we highlight principles and list policies that move us towards these objectives. These are soundly based on international research and experience, and the union movement’s own long experience of representing workers and their families, and of advancing productivity in the New Zealand workplace. They build on work the CTU has done over a period of years, summarised in the Appendix from our publication “Te Huarahi mo nga Kaimahi”. Growth is the engine that drives capitalist economies – indeed we don’t know if capitalism can survive without growth. But sustainable economic development explicitly takes account of a broad range of side effects of economic activity (externalities). An economic return still matters. But so does the quality of the environment, indigenous culture, a functioning society and strong communities. And we need to be taking into account the increasingly apparent limits to resources which mean that growth in its current form is not indefinitely sustainable. Our aims for working people can only occur if there are healthy firms and public services to provide decent work, good wages, and high quality products and services. Many New Zealand firms struggle to survive, let alone thrive, in the open economy. We need economic development that encourages new businesses and gives existing business a better chance; which encourages regional development and alternative forms of development such as those built on cooperatives; which encourages wealth creation through productive investment with good, viable jobs, and discourages financial manipulation; which stabilises the exchange rate and allows interest rates to be set to suit New Zealand’s needs; and which aligns our international economic relationships with our economic development objectives. The market economy will provide many of these outcomes, but by no means all, and in many areas, it will obstruct healthy development. The market is a tool to be used appropriately, not a master or a mantra. Capitalism is brutal but innovative and our aim is to retain and spread the benefits of innovation while policing its brutality. The excesses of the financial sector, asset-stripping corporations and destructive environmental practices need to be reined in. The government has many important roles, including regulating the economy, to providing, redistributing income, and stabilisinig the economy in difficult times. It needs to be adequately funded through a progressive taxation system to carry out those roles. One area in which a market economy demonstrably fails without government intervention is in sustainably maintaining a healthy environment. The dangers to the environment through climate change now make it clear that an economy cannot be sustainable without a sustainable approach to our environment, nationally and internationally. Sustainability requires polluters to remedy or pay the cost of their effects on the environment. It needs to be a consideration in everything the economy does. Market mechanisms can help with this but are unlikely to be sufficient. At the same time we must recognise the practicality of transition to this more realistic world and ensure that people who can least afford the change, including many working people, are helped through it. We recognise we are pushing the limits of what the world’s environment can stand. Improving living standards will increasingly need to be from doing things differently – more efficiently and fairly – rather than simply producing more. Higher productivity will help. This demands that our firms and government agencies make full use of the skills and experience of their employees through their genuine engagement in their workplaces. It requires constant attention to raising skill and education levels in our workplaces and community. Productivity will not rise if firms rely on low wages (as they have in the past) and neglect investment in existing and new technology and in the skills and commitment workers can use to get the most out of it. The following policies address primarily these factors but also assist and complement the other pillars. The economy is not out of trouble. There are still great uncertainties internationally, and even though GDP has started to rise again, unemployment is forecast to remain high for two to three years. Continued government stimulus continues to be needed. The CTU has over the past two years made a long list of suggestions for immediate actions which would also have longer term benefits which included regional and major national infrastructure spending, investment in education and health, tourism projects and promotion, support for iwi initiatives such as housing, further investment in home insulation and clean heating, and rail projects identified by Kiwi Rail. We need to look more actively at how we want the economy and society to look as we come out of recession. This would be a good time to expand productivity initiatives based on successful experience. In particular the government should support broadening across industries and workplaces of tripartite productivity good practice projects which have been underway for some years. • Boosting the 9 day fortnight to include higher wage support for the half day out of work (currently only the minimum wage), and funding training as part of the package. • Bridging funding based on criteria below. This could be in the form of provision of or guarantee for commercial loans, or funds from the Reserve Bank at low interest rates. • Expansion of youth opportunities and community employment schemes. This support should not be open-ended or unconditional. It should be based on performance, and temporary. Its criteria, processes and actions should be transparent and both firms and government agencies should held accountable for the outcomes. But at the same time it should recognise that firm development is not a short term process of steady growth. Assistance must be sufficiently patient to take into account the fluctuations of markets and external forces. • There is a commitment to principles of skills development and fair remuneration throughout the firm. • but also having effective powers to break up cartels and ensure firms do not otherwise get into dominant market positions and are effectively regulated where that is unavoidable. * A national physical telecommunications network owned either by central government or by regional local government owned providers (similar to the successful electric power boards before the 1990s reforms) to provide free broadband infrastructure, with recognised right to access in all parts of New Zealand. This could include Telecom’s current physical network to allow a more efficient transition from its old copper network to fibre, and the continued use of copper if and where it provides similar speeds to fibre. However the purchase of this network should be at a price that recognises the imminent obsolescence of significant parts of it and Telecom’s failure to maintain and develop it in the national interest. * Start to buy back the electricity system by taking a controlling stake in Contact Energy and Trustpower and regulate in order to optimise it for a combination of security of supply, low cost, and reduction of environmental impacts. This could be funded through long term Kiwi bonds. It should also enable households and businesses to sell surplus power to the network. * Development of public transport in cities, including both bus and rail, and encouraging development of local suppliers of equipment (such as Canterbury’s DesignLine bus manufacturing and KiwiRail’s Hillside and Woburn workshops. * Sufficient capacity in the core public service to provide quality and timely analysis and advice. * Continued full government ownership of state owned enterprises. o new forms of Intellectual Property ownership similar to “open source” software, “creative commons” licensing and the practical application of publicly funded research by our universities and CRIs, in order to enable sharing by firms and extracting the widest benefit from them rather than conferring limited monopolies. • Improve the utilisation of our public research capability by moving most government funding of research to centres of excellence (formal or part of existing institutions) and capability funds such as PBRF and CRI core funding, away from contestable funds. Centres of excellence to have a requirement to collaborate with all New Zealand experts and users in the field. These economic development policies will encourage firms to invest in new equipment and processes and to engage in research and development. Industry collective agreements and standards should combine realistic wage setting with the elimination of wage reductions as a competitive strategy within sectors. This keeps the focus on raising productivity through investment and gives workers confidence they will see its results in their wages. Increasing worker participation should be recognised as an essential part of good management practice such as in developing productivity, making the most of new technology, and in making changes in the workplace. Good management practice should be developed and disseminated through programmes of mentoring and training through employer organisations. Early childhood education is an effective basis for future educational achievement. We should build a national network of high quality local publicly owned early childhood education centres with increased support to ensure that it is responsive to Maori, Pasefika and migrant children, and meeting a target of 100 percent of qualified teachers. Schools must be resourced to at least keep up with rising costs, including salaries, provide continuing professional development to staff to enable them to provide the most effective educational environment for children and young adults as they develop, and to provide the capital to develop their facilities without being forced to rely on private operators. Pathways to tertiary education and between tertiary education providers should be simplified. Tertiary education will benefit from the human capital fund above. Funding should take into account the greatly varied scale, context and expectations of the different public institutions, and should be much less driven by learner numbers. It should recognise the local and international demand for tertiary education staff and the often scarce skills they bring. Tertiary education should be available to all who have a reasonable likelihood of benefiting from the courses they enrol in. Lower fees should be available to students who are willing to be subject to a bond which requires them to take certain types of work in New Zealand for a certain number of years. Apprenticeships should be encouraged and industry training provision should be conditional on employers in those industries recognising the acquired skills in their workers’ pay scales. The private sector should be reviewed to fully understand its contribution with a view to encouraging public good rather than private profit provision of tertiary provision. Life-long learning and skill development should be supported through funding of fees and allowances for one year for every five in the workforce or child care. Education could be workplace based, or through an educational institution. Employer support for skill development should be encouraged by regarding spending on skills and education as an asset acquisition which can be written off over five years. Education can support the development of environmental sustainability through special funding for apprenticeships and programmes in industries and subject areas that are environmentally sustainable or that support sustainability. Funding categories in tertiary institutions should be reviewed with a view to reducing fees in such subject areas, as well as other areas in which skill shortages exist or are anticipated. where that would give them sufficient experience and scale to bid for future work or diversify into related markets, particularly export markets. • Support Māori economic development including the role of tribal and Māori urban authorities in securing a sustainable base for Māori. • Reject involvement in forms of privatisation such as public-private partnerships. • Ongoing support for Treaty settlements. * consider ways to ensure the benefits reach Māori workers. • Satisfy criteria for a “good employer”, including being a party to an industry standard employment agreement where it exists and making a commitment to principles of fair remuneration throughout the firm. • Satisfy tests for priority employment of New Zealand residents etc. Temporary immigration for employment should be very limited, subject to strict skill shortage tests, good employer requirements, commitment to training New Zealanders for the roles where appropriate, and be subject to specialised bilateral agreements with source countries. Regional economic development is important to make the best use of our resources, assist disadvantaged regions, and nurture new ideas. Central government can support local government in its development of local industry and services such as through industry clusters and use of local government procurement to assist local industry. Many of the above policies could be applied at the local government level with or without central government support. New Zealand has a long history of very successful producer (such as farmer) cooperatives, mutual societies and other community owned service providers such as trustee savings banks. In 2007, the combined turnover of cooperatives and mutuals was over $27 billion, according to the New Zealand Cooperatives Association. Producer cooperatives should continue to be encouraged. Worker cooperatives are comparatively rare however. Worker cooperatives have the potential to maximise worker participation. Cooperatives which employ only their owners, and are owned only by their employees can be encouraged by taxing the cooperative at the individual employee/owners’ tax rates, suspensory loans to aid at start-up and for the introduction of new technology, and cooperative incubator support like the business incubator model. The financial system needs to support economic development. But in the wake of the Global Financial Crisis and the recent experience of the behaviour of our own financial institutions there is much needed to be done to return the financial system to stability and to its role supporting economic development rather than following its own anti-social interests. While the Australian and New Zealand banking system emerged comparatively unscathed from the Global Financial Crisis, we are not convinced that was due to the quality of its institutions or its regulation. In addition, the behaviour of the financial sector in past years has given numerous causes for concern. The following issues need to be addressed. The dependence of New Zealand on the Big Four Australian owned banks which account for 90 percent of the assets of the banking sector raises major policy issues if one or more of them should become illiquid (as nearly happened in the crisis) or fail, or if one or more of them should threaten the governmental with some form of capital strike (as mining companies are threatening in Australia over the proposed resource tax) if they do not like government policies. These are issues of systemic stability. We propose the following. • Encouraging the expansion of what has proved to be responsible banking such as trustee banks, mutuals and cooperatives. • Encouragement for private (e.g. Kiwisaver) superannuation funds to invest locally through a 10 percent reduction on tax paid by a fund on income from New Zealand investments, to be reviewed after five years. • Encouraging domestic savings and their investment in economic development through changes in housing policies, and further expansion of the Kiwisaver scheme (see below). The single focus of monetary policy on consumer prices and the use of interest rates as the predominant tool to control inflation has damaging effects on economic development by frequently forcing up interest rates beyond rates that make new projects feasible, and raising the exchange rate by attracting foreign funds to profit from the higher rates. Monetary policy can be an important tool in economic development and stabilising the economy. It needs to return to that vital role, while maintaining the control of inflation as one of its objectives. However the exchange rate will remain a problem while there are no controls on capital movements. * Give the Reserve Bank an active role in stabilising the exchange rate through management of international capital flows and currency controls, seeking cooperation and agreements with other nations. * Broaden the terms of reference for monetary policy beyond inflation to include employment, living standards, the exchange rate and other matters. • In order to tighten monetary conditions, the Reserve Bank could require an increase of up to a further 1 percent compulsory contribution (that is, no more than 3 percent in total), the proceeds of which would go into a special Holding Fund, in which each individual’s contributions were identified. • When monetary conditions are relaxed, the Holding Fund contributions are released back to the contributors, giving each the option of taking it as cash or adding it to their superannuation funds. We need to reduce our vulnerability to international financial crises, and demands of overseas investors, often expressed through credit rating agencies. There is international support for some of the policies we need. Others we need to take unilaterally and build international support for while not taking any further steps which worsen the situation. * A small financial transactions tax (“Tobin tax”) to discourage speculative financial market transactions which can cause volatility in the exchange rate and create instability in the financial system. * Support recommendations of the Commission of Experts of the President of the UN General Assembly on Reforms of the International Monetary and Financial System. * Minimum maturities (terms) of overseas borrowing, and matching of maturities between borrowing and lending. With regard to trade and investment agreements, we should make no further concessions with regard to financial services, investment, intellectual property, measures that constrain our ability to protect the environment, or services, including health and education, with implications for public regulation or provision or New Zealand’s economic, social or cultural development. Any arrangements regarding the movement of people for work should be specific and separate agreements. We should work with others to undo constraints such as those which heighten the risk of financial crises. • Controls on foreign direct investment to enable selection of beneficial investment and enforce corporate responsibility, allow developing firms to survive in New Zealand, protect strategic assets and prevent asset stripping such as through leveraged buyout and private equity investors. * Respect the development aspirations of Pacific nations, and the inequality of power relationships between Australia and New Zealand on the one hand and the other nations on the other. • Build on existing international union links, global union federations, and Codes of Conduct and International Framework Agreements between global union federations and transnational corporations, to create trans-national union collaboration in campaigns and organisational development, and where possible and appropriate international collective employment agreements. • Work towards trans-Tasman employment agreements with a growing base of conditions common to both countries. The state plays an important role in regulating markets, including for example electricity, telecommunications, and the financial sector. It also has an important role, particularly in a vulnerable open economy, in stabilising the economy both through action in times of crisis and in creating automatic stabilisers through the social welfare system. • Preventing excess profits in important services which are a monopoly or are otherwise less than fully competitive. For public organisations, the form of management, accountability and financial accounting should recognise that public services have different objectives and may have different organisational structures from private sector organisations. There should be sufficient capacity in the core public service to provide quality and timely analysis and advice. At the same time there are themes in common with other workplaces: sustainable services, productive workplaces, worker participation. Public services should meet the needs of citizens, and provide value for money (“public value”). This requires an openness to discuss these matters with citizens, and to listen to what they say. It will work best when the voice of workers is valued in a high-trust public service workplace. Because of its size and ability to tax and borrow, the state is best placed to provide security that is not otherwise available to individuals, with a welfare system based on reducing inequality, and ensuring dignity rather than a safety net (see above). Government procurement can also be used to encourage economic development, as described above. • The firm is party to an industry standard employment agreement where it exists and there is a commitment to principles of skills development and fair remuneration throughout the firm. It is essential that the state is sufficiently resourced to carry out its functions and carry out its important redistributive role. Taxation can also encourage and provide support for productive investment and for other positive directions society determines. Progressive income taxes are important sources of income and play a central part in redistribution, lessening income inequality, which becomes increasingly important in the context of resource-limited economic growth. Income tax: Create either a tax-free band and/or a tax rebate for those on incomes under $35,000. The income tax scales should be augmented by a 38 percent rate on income more than approximately twice the average wage ($100,000) and a 45 percent rate on income more than approximately three times the average wage ($150,000). Reduce GST to 12.5 percent and progressively replaced it with other forms of taxation including asset taxes (see below), the international Financial Transaction Tax and the FAT tax explained above, and taxes or increased royalties on commercial use of resources. Polluters should face taxes on their emissions, including greenhouse gas emissions (see Climate Change below), with the aim of them paying the costs of all significant “externalities” (side effects such as pollution and global warming). However this should be done in a way that ensures people on lower incomes do not end up paying an unfair share of the burden. We should investigate improvements to the welfare system through the tax system including at least partially replacing Working for Families with a tax free threshold on personal income, like in Australia. See also Social Security below. • Apply thin capitalisation rules to overseas owned companies with a debt threshold at 50 percent. • Consider ceasing tax deductibility of interest on related party borrowing. • End deductibility of rental property losses against personal income. • A capital gains tax or a “Risk Free Rate of Return” tax on assets, subject to equity considerations: that is they should be designed to be progressive, aimed primarily at investors, exempting a household’s primary occupied home. • Promotion of new investment in low carbon technologies. • Research and Development funds for green technology and services such as manufacturing capacity for wind and wave turbines, solar energy, bio-fuel from waste, geothermal energy, reducing carbon emissions in fossil fuel energy generation. • Education and training in the skills required for anything from installing insulation and clean heating in homes through to energy analysis and the design of new buildings and energy generation plants. • Renewable energy and energy efficiency projects. • Green retrofitting of commercial buildings. • Green conditions in collective employment agreements such as encouragement to walk, cycle or take public transport to work. There is considerable evidence that emissions of greenhouse gases are a cause of harmful climate change. The risks of doing nothing could be catastrophic. Therefore we support a price on emissions so that a clear signal is sent to emitters. However this needs to be strengthened with a major programme to transform the economy. • Major investment in skills for a low carbon economy. • Union involvement in decision making on such changes at all levels, from national policy-making, to regional and industry change, to involvement in local negotiations, such as those surrounding environmentally-triggered plant closures. Public services and public sector leadership at all levels of government must be at the heart of the global response to climate change. Public involvement in technology transfer in the utilities sector, for example, should be encouraged and financially supported. Public procurement contracts should include specifications for labour and environmental sustainability standards. Countries tend to evaluate their progress by increases in measured output – usually by GDP per person. It is widely acknowledged that this is a poor measure of wellbeing and progress. For example it counts money spent on building a prison or cleaning up an oil spill as if it were as beneficial as building a new school or paying the wages of workers in a factory. Crime and environmental degradation can make GDP look better, and no account is taken of the loss of asset values when we mine minerals or damage an ecosystem or the benefits of leisure and public assets like parks and beaches. It takes no account of the value of unpaid work in homes or voluntary organisations. Nor does GDP measure the changes to most aspects of the nation’s wealth other than those in the market economy and government. It ignores depletion of resources such as oil and minerals which reduce the country’s wealth while it increases that of the new owners, and ignores damage or improvement to the country’s natural wealth including its environment such as pollution or clean-up of rivers and its “human capital” in the skills, knowledge and experience of its people. There are better indexes being developed to measure progress which discount “bads” and take into account wider indicators of social, economic and environmental wellbeing, and a broader view of wealth. Examples include indexes being developed by the Commission on the Measurement of Economic Performance and Social Progress initiated by the French President and headed by Joseph Stiglitz and Amartya Sen; Statistics New Zealand’s new regular reports Measuring New Zealand’s Progress Using a Sustainable Development Approach; Marilyn Waring’s General Progress Indicator; and the Canadian Genuine Progress Index. One or more of these indexes should be adopted to use alongside GDP to guide national decision making and priorities. The economy must pay good wages and salaries. We can have sustainable economic development only if we stop losing many of our most able people. Good wages also mean people have the money to buy goods produced in New Zealand so we have a strong domestic economy as well as trying to export more. Sustainable growth in workers’ incomes is based on two essentials: higher productivity, a focus of sustainable economic development; and passing on the gains into higher wages and salaries. Good wages are a matter of being fair as well as being good for the economy. Working people have not received a fair share of the growth in the economy over the last two decades. Workers will make a commitment to their work if they see the results benefiting them and the community, and their jobs being rewarding in human as well as financial terms. We know from New Zealand’s experience over the last two decades that the benefits of higher productivity will be passed on into higher wages and salaries only if there are effective unions and supportive employment legislation. There are wider benefits. The creation of collectively based employment agreements negotiated by effective unions creates “automatic stabilisers” which during a recession such as the current one ensures that wages don’t crash, reducing demand and worsening the crisis. Business says it needs certainty, but people do even more so. Full employment and security of employment and income are critical, but there are benefits if security is combined with sufficient flexibility to allow firms to adapt to changing circumstances. People also need to be confident that if they lose their jobs, suffer ill health, injury or relationship break-ups, and when they retire, that they can maintain a dignified existence. They need to be able to afford good quality housing and other essentials of life. A healthy society in which we can live a good life does not have high levels of inequality. Inequality leads to inferior physical and mental health, educational achievement, crime levels, and social mobility, which in turn create real economic costs. A healthy society respects and rewards people regardless of their gender, culture or ethnicity so that all can make a contribution to society making full use of their abilities. 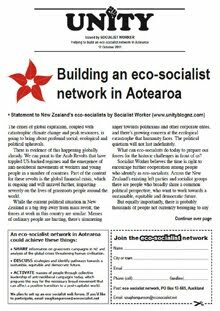 • create a broader union movement including forms of organisation that allow workers to easily associate and participate. • Develop a formal proposal for a more structured approach to social partnership. This could include considering the desirability of establishing a Living Standards Review Authority reporting to a National Tripartite Social/Economic Council. Every three years it would review standards of living, social and tax policy, price levels and increases, and productivity changes. It would hear submissions from the NZCTU and Business NZ, and initiate tripartite discussions and make recommendations and agreements on measures to address equitable distribution of incomes. • Action some of the large range of possible initiatives which would both have long term benefits for the economy and quickly create jobs which the CTU put forward for the Job Summit (see above for examples). See also Housing, below. • Improved support for people who do become unemployed including support in career advice, applying for jobs, adding to their skills and education, and assisting with relocation if they wish. • For those unemployed over 13 weeks, an entitlement to a Skills Investment Fund Booster package that adds to the normal level of the Skills Investment Fund support to take to new employment and provides access to individually tailored skills audits. • Full employment a central objective of government policy. • Adopt a policy of “Flexicurity” which provides security of employment along with sufficient flexibility to allow firms to adapt to changing circumstances. * Maintenance of 90 percent of prior income during unemployment for up to 12 months, conditional on commitment by the worker to acquiring new skills if necessary, and job searching. * Active labour market policies to provide support to find new jobs and assistance in moving to another region if necessary. * Financial and practical support for acquiring new skills and qualifications. * Tripartite design, governance and implementation of the programme. * Normal unemployment benefits to apply after 12 months if still unemployed. Review adequacy of other benefits to eliminate poverty, with the aim of tying their base rates to a proportion of the average wage. See also under Taxation above. 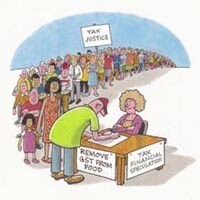 Return ACC to a social compensation scheme funded on a “pay as you go” basis through levies and taxation. Housing is both an essential part of our health and standard of living and a central factor in New Zealand’s lack of funding for productive investment. We need to assure people of access long term to low cost, quality housing while encouraging savings to be invested in other areas. The tax policies we propose will help. • Encouraging “inclusionary zoning” that requires developers to include to make provision for affordable housing in developments, or levy developers where they do not wish to do so, to provide a fund for affordable housing. • Requiring each local council to insist on an affordable quota of houses in its area, some of which it provides directly. • Sponsoring designs for low cost, green and healthy owner-occupied housing. • Housing New Zealand housing stock to reflect changing demographic patterns in New Zealand, providing low cost communal and supported housing that better reflects the multi-cultural needs of those that inhabit its homes. • Enforcing current rules taxing capital gains made by property speculators to discourage housing price bubbles. • Capital gains or asset taxes as described under Taxation. • Ensuring that there are sufficient skilled workers available to build and maintain housing through a higher level of investment in industry training in this sector as it comes out of recession. • Phasing out accommodation supplements (worth over $1 billion a year), which effectively act as a landlord subsidy and thus encourage higher rents, in favour of assistance with home loans for low income families and public rental and third sector housing programmes. • Subsidising home lending in tailored programmes for targeted groups including low income households, key workers whose recruitment and retention is affected by housing difficulties, women, Māori, and Pacific people and other financially disadvantaged groups. Each may benefit from a different programme. • Expanding shared equity schemes in which the government or a private entity takes a share in the house which is returned when the house is sold as a proportion of the sale price. • Restricting sales of residential property to permanent residents and New Zealand citizens only. Maintain New Zealand Superannuation supported by a New Zealand Superannuation Fund to which contributions should be resumed as soon as practicable. Reducing inequality is a theme in the above policies. Other means to reduce inequality will be sought, and reduction of inequality will be a criterion in the evaluation of new policies. Our policies for more effective unions, industry agreements providing benefits beyond union members, workplaces that value worker participation, and more generous unemployment and social security benefits are all important in reducing inequality in both income and power. An additional measure would be to introduce progressive electricity prices, entitling every household to a certain amount of electricity at a lower cost than additional units. • Give workers the right to require a Pay and Employment Equity assessment in workplaces. Apply the tools and policy developed over the last decade to advancing Pay and Employment Equity in both public and private sector employment. • Extend the paid parental leave entitlements to 52 weeks for the eligible parent; ring-fence paid paternity/ partner levels of 4 weeks; and increase payment levels for the eligible parent to 66% of the average weekly earnings while on parental leave. • Increase the minimum wage to $16.87 per hour, and continue to maintain it at 66 percent of the average wage. This both increases demand (important during a recession) and reduces inequalities. One vote every three years does not make a healthy democratic society. The issues that confront society are much more complex and changing. Indeed General Elections are bringing less effective public debate and less real change. The workplace is currently a democracy-free zone. We must find ways to increase public participation in the issues of the day and for workers in their workplaces. Effective unions are an important part of that. Sustainable economic development, decent work and a good life for everyone does not arise through a utopian vision. It requires constant trade-offs in the real world of markets, governments and the pressures and opportunities of globalisation. Hugely disparate outcomes arise because of unequal power. Part of this is about resources. But voice is a means of influence. The changes that we advocate here should not be seen as a blueprint but part of a process of the continuous rethinking of society that is required in rapidly changing circumstances. That can only be done if there is a political process that gives voice to the many different objectives that co-exist in our society rather than allow the process to be dominated, as it is at the moment, by powerful economic interests and media controlled by them. In many ways, the process is as important as the objectives because there will be no endpoint: society will continue to develop and must find ways to do so which produce acceptable compromises. Central and local government should require a process of consultation with social partners (unions and business) and other affected groups in all policy development and legislation. Key bodies representing these groups should be funded to enable effective involvement in consultation. Public services should be designed to meet the needs and values of citizens by consulting with them and the public service workers who implement them. Given high levels of labour market participation, the workplace should be seen as a location for active citizenship. All enterprises of 20 or more workers should provide access to community organisations to hold lunch-time (or other appropriate time) sessions to consult on local issues. This should include an opportunity for local councils to consult. • Encouragement of trust-owned “public service” newspapers and other media in which all profits are reinvested in the publication, like the Scott Trust which owns the Guardian and Observer in the U.K.
• Funding for investigative print journalism through the equivalent of “New Zealand On Air” funding. Increasing worker participation is recognised as an important part of good management practice. There is an economic rationale for this: maximising productivity requires that employers make full use of the skills and experience of their employees. This comes through the active and willing participation of workers in their workplace. In addition, the changes in work that are accelerated by international competition and new technologies will be made more quickly and effectively if workers have a say in their workplace and skills development. 1. Representative structures for participation at workplace level which broaden and deepen employer-union engagement. 3. These could also feed into the National Tripartite Social/Economic Council described above. The value of having unions alongside good management practices in workplace organisation (such as in productivity initiatives) should be recognised through a requirement to involve unions throughout processes of change in workplaces, workplace structures, and development of new skills. Health and safety representatives and learning representatives should be supported with a major expansion of current initiatives. Other options for worker participation should also be considered including worker representation on boards and on-line consultation forums for workers and management.